Background: Paeonia sinjiangensis K.Y. Pan is a perennial herb belonging to the ranunculaceae family and it is one of the most important crude drugs in traditional Chinese medicine. In this article, Paeonia sinjiangensis K.Y. Pan rich in polysaccharide is used as an experimental material. Materials and Method: Study the effects of proportion, temperature, times and time taken for the extraction yield of polysaccharide through a single-factor exploration. Then, through an orthogonal experiment (L9(3)4), it was investigated to get the best extraction conditions. Results: The results showed that the ratio of solvent to raw material, number of extractions and duration of extraction were the main variables that influenced the yields of extracts. The separation procedure of precipitation with alcohol and the purification from the removing proteins were deeply analyzed. Meanwhile the contents of polysaccharide were determined by anthrone colorimetry. Conclusion: The highest yield was obtained when the ratio of solvent to raw material, number of extractions, and duration of extraction were 8:1, 2, and 1.5 h, respectively. The content of soluble polysaccharide is 51.57%. Background: Gentiana olivieri Griseb. (Afat) (Gentianaceae), which has many bioactive compounds is used as antidiabetic, hepatoprotective, digestive aid, antidepressant, and antianemic in traditional medicine. 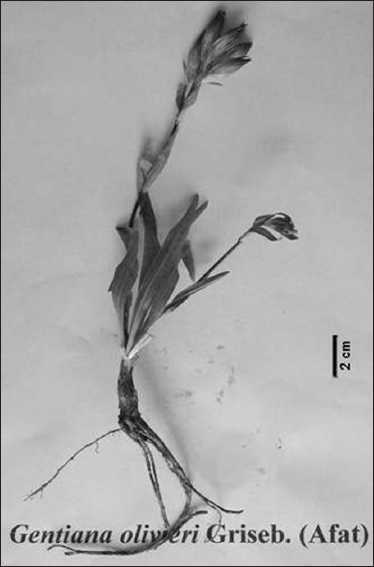 Materials and Methods: Root, stem, and leaf sections of G. olivieri were taken free hand or by sliding microtome and examined on light microscope. Results: Anatomical characters of the species were observed to be similar to the usual features of Gentianaceae anatomy. Conclusion: Intraxylary phloem, which was primarily the distinguishing feature between Gentianoideae and Menyanthoideae sub-families was observed in G. olivieri roots. Background: Garlic plays an important role in complementary and alternative medicine. Most people believe in and use herbal products even when they have not been as thoroughly researched as garlic. Garlic is also known for its beneficial effects on the cardiovascular system. Materials and Methods: The relaxant effect of Allium sativum L. bulb aqueous extract (ASBAE) containing 0.06%-0.10% of allicin was studied on isolated smooth muscle of trachea of rats precontracted using acetylcholine (10−5 M). Results: It was found that ASBAE induced a dose-dependent relaxation with recorded EC 50 values of 71.87 ± 5.90 μg/mL (n = 7). Pretreatments with mepyramine (10−7 M), methysergide (10−7 M), caffeine (10−6 M), theophylline (10−6 M), nifedipine (10−6 M), and dipyridamole (10−6 M) did not alter ASBAE concentration-response curves. In turn, concentration-response curves to ASBAE were significantly shifted toward right in the presence of aspirin (3.10−3 M), indomethacin (10−6 M), prazosin (10−6 M), and propranolol (10−7 M). Conclusion: It is suggested that the recorded relaxation results are due to the release of prostaglandins E 1 and E 2 consecutively to a- and b-adrenoreceptor stimulation. Objectives: To evaluate the antihypertensive effect of Xinjiang red raspberry fruit ethyl acetate extract (EER) on spontaneously hypertensive rats (SHR) and its possible mechanism from antioxidant perspective. 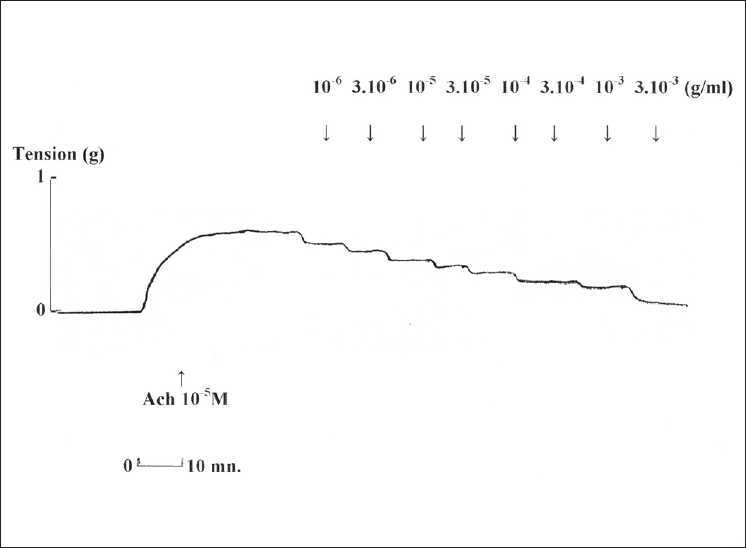 Materials and Methods: The SHR rats were randomly divided into 3 groups, and treated with EER low dose (EERL, 100 mg/kg/d), high dose (EERH, 200 mg/kg/d), and water (SHR) through gastric gavage daily for 5 weeks. Another 8 age-matched male Wistar-Kyoto rats were used as normotensive group (WKY). The systolic blood pressure (SBP) was measured by noninvasive tail-cuff method once a week. At the end of the treatment, blood samples were collected and serum concentrations of nitric oxide (NO), superoxide dismutase (SOD), malondialchehyche (MDA), and plasma endothelin (ET) were determined. 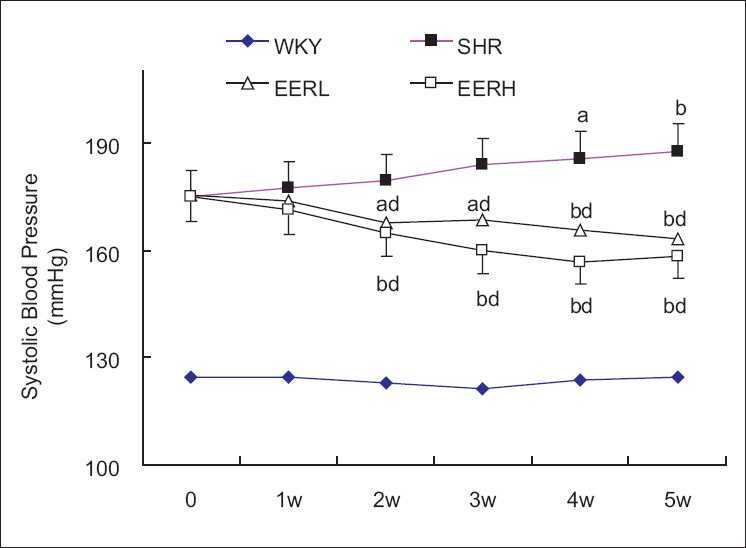 Results: Treatment of SHR rats with EER lowered the blood pressure compared with that treated with water (SHR), and the high dose showed more significant reduction in blood pressure. Treatment of SHR rats with EER increased serum NO and SOD levels and lowered ET and MDA levels. As compared with control group, NO levels were increased significantly in EERL (P < 0.01), SOD was elevated more significantly in both EERL and EERH (P < 0.01); MDA was decreased significantly in EERH group (P < 0.05), whereas plasma ET decreased more significantly in the EERH group (P < 0.05). Conclusions: The red raspberry extracts demonstrated a dose-dependent antihypertensive effects in SHR and this may be related to increased NO activation and improved vascular endothelial dysfunction via antioxidation. These results confirmed that raspberries rich in polyphenols have potential cardiovascular protective effects. Background: Diabetes mellitus is gradually becoming a global health burden leading to an increase in the search for herbal hypoglycemic agents as alternatives to synthetic ones. Asystasia gangetica is one of the herbs used in folklore system of medicine for managing hypoglycaemia associated with diabetes. Materials and Methods: The influence of the juice of A. gangetica leaf on alloxan-induced diabetic rats was assessed by treating diabetic rats with 25%, 50% and 75% fresh juice and glibenclamide for 5 weeks. Afterwards, the plasma concentrations of glucose, triacylglycerols, total cholesterol, high-density lipoprotein (HDL) cholesterol, thiobarbituric acid reactive substances and bicarbonate were assayed spectrophotometrically. 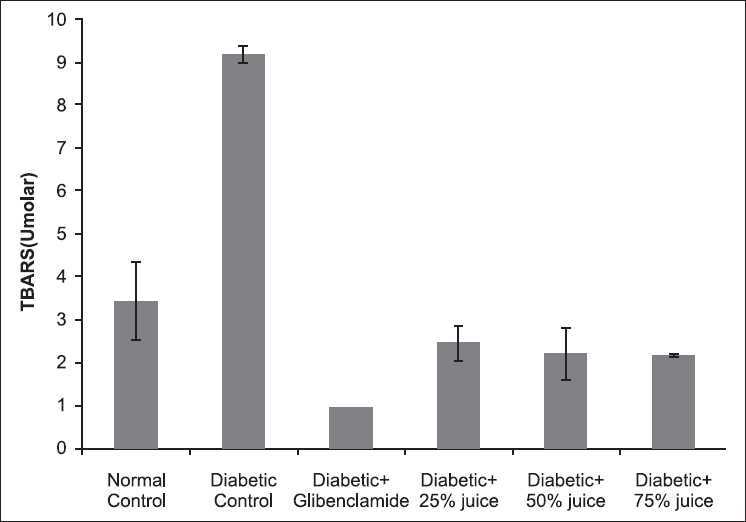 Results: Treatment of the diabetic rats with the juice significantly (P < 0.05) reduced the elevated plasma levels of glucose to a level not significantly (P > 0.05) different from that of glibenclamide. The juice also significantly (P < 0.05) reduced the plasma lipid peroxidation and improved the lipid profile, as indicated by a significant (P < 0.05) reduction in the total cholesterol: HDL cholesterol ratio. However, there was a significant (P < 0.05) rise in the level of bicarbonate as result of the juice treatment from 28.15 ± 2.82 mmol/l in normal control to 60.83 ± 17.46 mmol/l in diabetic control and to 122.20 ± 34.68 mmol/l, 120.95 ± 35.09 mmol/l and 115.85 ± 11.79 mmol/l in 25%, 50% and 75% juice, respectively. Conclusion: Therefore, this inability of A. gangetica to prevent acidosis detracts from the potential of its usefulness in managing diabetes. Background: Athamanta sicula L., a member of Apiaceae, is an annual perennial herb and it is known in Sicilian popular medicine with the name of "spaccapietre" (rock splitters), because fresh roots infusions are indicated as diuretic and used in the treatment of diseases of the urinary tract, and to dissolve kidney stones. Materials and Methods: Acetone extracts of leaves, flowers, and stems of A. sicula L. were investigated in vitro for antibacterial and cytotoxic activities. Antimicrobial activity was carried out against bacterial and fungal strains and antiproliferative activity against a group of human cancer cell lines (K-562, NCI-H460, and MCF-7). Results: All acetone extracts, apiol and myristicin, resulted inactive as antimicrobial agents at the maximum tested concentration of 200 μg/mL, but they induced significant antiproliferative activity on the tested cancer cell lines. Conclusions: Our study show that both apiol and myristicin could be tested as novel treatment in cancer chemotherapy. Background: The total flavonoid (TF) and total phenolic (TP) contents of the ethanol extracts of the whole plant, stem, leaf, and seed of Mimosa pudica Linn belonging to the genus Mimosa (Family: Fabaceae alt. Leguminosae), which originates from the subtropical regions of southern China, were determined in this experiment. Materials and Methods: The antioxidant activity of the extracts and 5 flavonoid monomers of M. pudica Linn. were also evaluated by 2 assays, the 1,1-diphenyl-2-picrylhydrazyl (DPPH) radical-scavenging activity and ferric reducing/antioxidant power (FRAP) assays. In addition, correlation analysis was also made in the present study. Results: The results showed that leaf extracts contained the highest amount of TF and TP, and the content was significantly higher than that found in other parts of the plant. 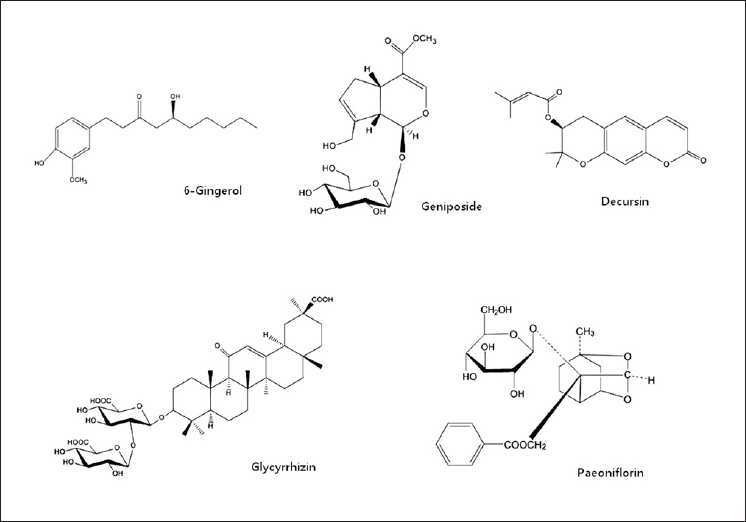 Moreover, the sequence of antioxidant activity of the ethanol extracts was as follows: leaf > the whole plant > seed > stem; the sequence of the 5 flavonoid monomers was as follows: 5,7,3′,4′-tetrahydroxy-6-C-[β-D-apiose-(1→4)]-β-D-glycopyranosyl flavone (1) > isorientin (2) > orientin (3) > isovitexin (4) > vitexin (5) , and the antioxidant activity of compound 1 is equivalent to the synthetic antioxidant trolox or a bit stronger than trolox, and significant correlations were found among the active ingredient contents and the results of antioxidant activity. Conclusion: The present study suggested that M. pudica Linn. could be a potential rich source of natural antioxidants. Background: Extraction temperature influences the total phenolic content (TPC), total flavonoid content (TFC) of medicinal plant extracts to a great extend. TPC and TFC are the principle activity constituents present in the plant. The effects of extraction temperature on TPC, TFC and free radical-scavenging capacity of Gynura divaricata leaf extracts are worth to study. 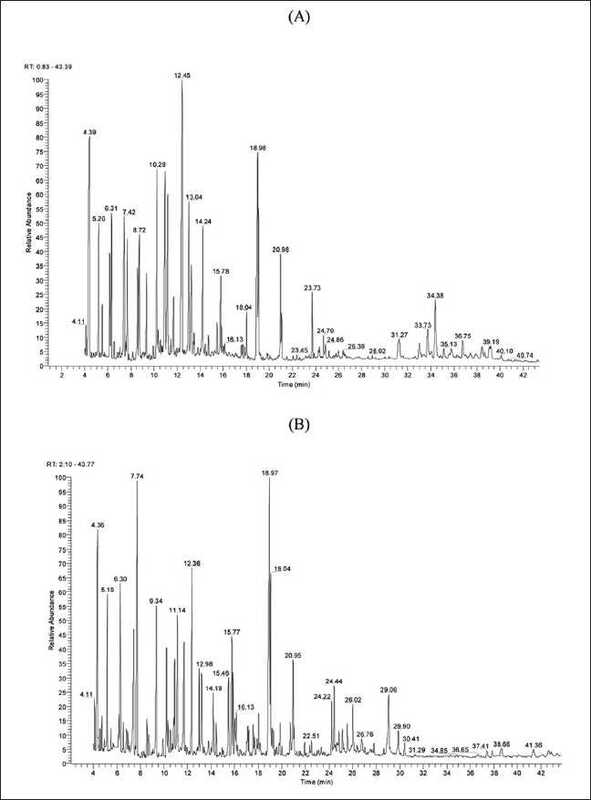 Materials and Methods: Folin-Ciocalteu and aluminum chloride colorimetric assay were used to determine the TPC and TFC of Gynura divaricata leaf extracts at different temperatures. The antioxidant and free radical-scavenging activity were measured by 1,1-diphenyl-2-picrylhydrazyl (DPPH), 2,2-azino-bis-(3-ethylbenzthiazoline-6-sulfonic acid (ABTS) and phosphomolybdenum methods. Results: TPC and TFC were significantly elevated with increasing extraction temperature (from 40°C to 100°C). However, TPC and TFC were not significantly different (P > 0.05) at the extraction temperatures 90°C and 100°C. 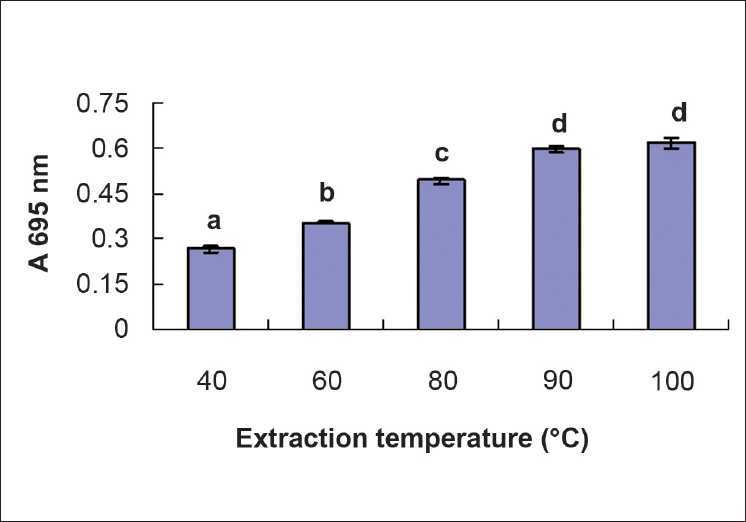 Also, the extracts obtained at a higher temperature exhibited a significant free radical-scavenging activity compared with extraction at lower temperatures (P < 0.05). The TPCs (13.95-36.68 mg gallic acid equivalent/g dry material) were highly correlated with DPPH (R2 = 0.9229), ABTS (R2 = 0.9951) free radical-scavenging capacity, and total antioxidant activity (R2 = 0.9872) evaluated by phosphomolybdenum method. Conclusion: The TPC and TFC of G. divaricata leaf was significantly influenced by the extraction temperatures, which were the main antioxidant constituents present in the G. divaricata plant. Background: The fact that antioxidants have several preventative effects against different diseases, such as coronary diseases, inflammatory disorders, neurologic degeneration, aging, and cancer, has led to the search for food rich in antioxidants. Honey has been used as a traditional food and medical source since ancient times. However, recently many scientists have been concentrating on the antioxidant property of honey. By use of human renal cancer cell lines (ACHN), we investigated the antiproliferative activity, apoptosis, and the antitumor activity of honey. Materials and Methods: The cells were cultured in Dulbecco's modified Eagle's medium with 10% fetal bovine serum treated with different concentrations of honey for 3 consecutive days. Cell viability was quantitated by the 3-(4,5-Dimethylthiazol-2-yl)-2,5-diphenyltetrazolium bromide assay. Apoptotic cells were determined using Annexin-V-fluorescein isothiocyanate (FITC) by flow cytometry. 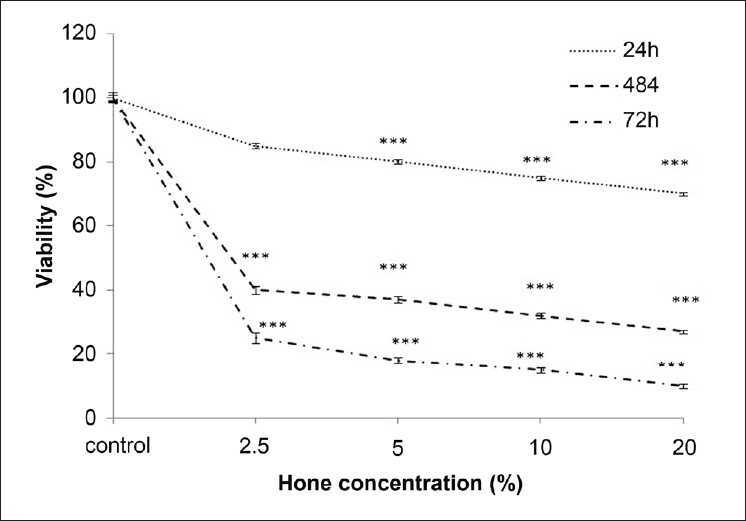 Results: Honey decreased the cell viability in the malignant cells in a concentration- and time-dependent manner. The IC 50 values against the ACHN cell lines were determined as 1.7 ± 0.04% and 2.1 ± 0.03% μg/mL after 48 and 72 h, respectively. Honey induced apoptosis of the ACHN cells in a concentration-dependent manner, as determined by flow cytometry histogram of treated cells. Conclusion: It might be concluded that honey may cause cell death in the ACHN cells, in which apoptosis plays an important role. Most of the drugs used in the cancer treatment are apoptotic inducers, hence apoptotic nature of honey is considered vital. Therefore, it prompted us to investigate honey as a potential candidate for renal cancer treatment. Background: Zataria multiflora Boiss. is a traditional and popular spice in Iran. The effects of 3 ecotypes (ECTPs) of Z. multiflora essential oils (EOs) against most common causes of food-borne and nosocomial infections were evaluated. Materials and Methods: The antimicrobial activities of the EOs were examined by broth microdilution method as recommended by the Clinical and Laboratory Standards Institute (CLSI). 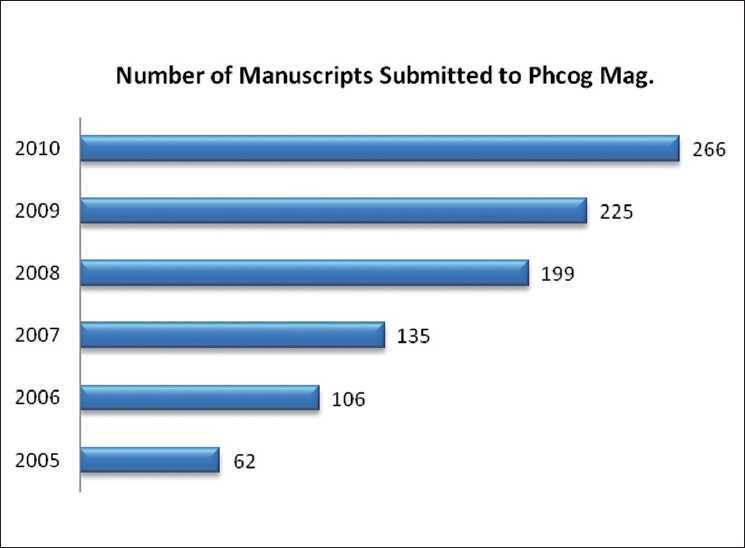 The chemical compositions of the EOs from 3 ECTPs of Z. multiflora have been analyzed by gas chromatography-mass spectrometry. Results: Analysis of the EOs indicated that 3 chemotypes were present in Z. multiflora, including carvacrol, thymol-carvacrol, and linalool, whereas previous studies have only found carvacrol and thymol. Inhibition studies showed that the tested EOs entirely inhibited the growth of yeasts at concentrations of less than 1 μL/mL. Moreover, the oils exhibited significant bacteriostatic and bactericidal activities against Gram-positive and Gram-negative bacteria at concentrations ranging from 0.12 to 8 μL/mL. Conclusion: These results suggest that the EOs from Z. multiflora should be investigated further for possible use in antimicrobial products and food preservatives. Background: Bangpungtongsung-san, one of the traditional herbal medicines, was known to be a prescription for obesity. Objective: For the simultaneous determination of five components (paeoniflorin, 6-gingerol, decursin, geniposide, and glycyrrhizin) in Bangpungtongsung-san, a high-performance liquid chromatography with diode-array detector method was established. Materials and Methods: To develop the method, a reverse phase column, DIONEX C 18 (5 μm, 120 Å, 4.6 mm × 150 mm) was used. The mobile phase consisted of methanol and water using a gradient elution. The UV wavelength was set at 230, 240, and 254 nm. Method validation was accomplished by linearity, precision test, and recovery test. Results: All calibration curves of components showed good linearity (R 2 > 0.9959). 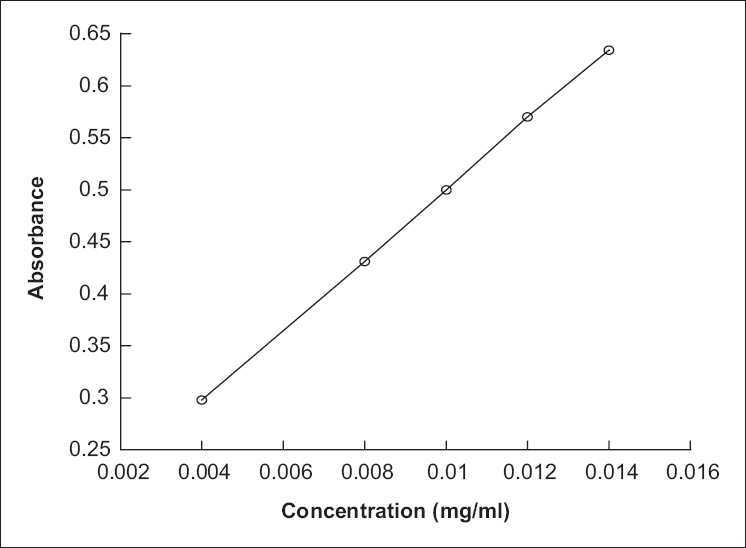 The limit of detection (LOD) and limit of quantification (LOQ) ranged from 0.01 to 0.17 μg/ml and 0.04 to 0.53 μg/ml, respectively. The relative standard deviations (RSD) value of precision test, intraday and interday tests were less than 0.43% and 1.26%. In the recovery test, results of accuracy ranged from 95.27% to 107.70% with RSD values less than 2.21%. Conclusion: This developed method was applied to the commercial Bangpungtongsung-san sample and the five marker components were separated effectively without interference of any peaks of components. Objective: This paper investigates the total polyphenolic and flavonoid content as well as the antioxidant activity of Ziziphora clinopodioides Lam. extracts of different polarity. Materials and Methods: The total polyphenolic content was analysed using the Folin-Ciocalteu method. Total flavonoid content analysis was performed using the colorimetric method. Results: The total polyphenolic content of Z. clinopodioides is concentrated in parts of ethyl acetate (19.27%), chloroform (4.99%) and n-butanol extracts (3.94%) containing a small amount of the total polyphenolic content. 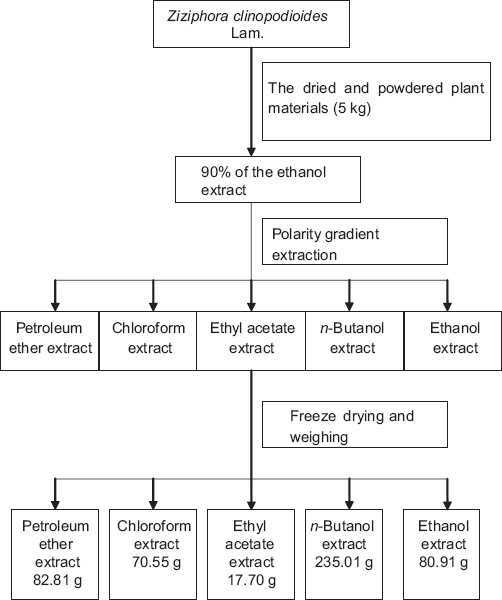 The petroleum ether (0.23%) and ethanol extracts (1.64%) contain almost no polyphenolic content. The total flavonoid content of Z. clinopodioides is concentrated in parts of ethyl acetate (65.61%), chloroform (14.36%) and n-butanol extracts (10.76%) containing a small amount of the total polyphenolic content. The Z. clinopodioides Lam. ethyl acetate extract exhibits a good antioxidant activity. Conclusion: Ethyl acetate extracts contain a large number of polyphenolic compounds (19.27%) and flavonoids (65.61%) owing to good antioxidant capacity. Currently, a majority of the adverse events related to the use of herbal products and herbal medicines that are reported are attributable either to poor product quality or to improper use. Inadequate regulatory measures, weak quality control systems, and largely uncontrolled distribution channels (including mail order and Internet sales) may have been contributing to the occurrence of such events. In order to expand the knowledge about genuine adverse reactions to herbal medicines, and to avoid wasting scarce resources for identifying and analyzing adverse events, events resulting from such situations will need to be reduced or eliminated. Member States of the World Health Organization (WHO) are therefore encouraged to strengthen national regulation, registration and quality assurance and control of herbal medicines. In addition, the national health authorities should give greater attention to consumer education and to qualified practice in the provision of herbal medicines. It is well known that phenolic compounds are constituents of many plants. In this study, the total phenolics content in Crocus sativus L. corms in dormancy and waking stages were determined by the Folin-Ciocalteu method. Analysis was carried out by gas chromatography-mass spectrometry (GC-MS) after silylation by N-methyl-N-trimethylsilyl trifluroacetamide (MSTFA) + %1 trimethyl iodosilane (TMIS). Numerous compounds were detected and 11 compounds were identified. The highest phenolics content in waking corms was observed for gentisic acid (5.693 ± 0.057 μg/g) and the lowest for gallic acid (0.416 ± 0.006 μg/g); also these two phenolic compounds are the highest (0.929 ± 0.015 μg/g) and lowest (0.017 ± 0.001 μg/g) phenolics in dormant corms, respectively. The results from quantization and GC-MS analysis showed a high concentration of phenolic compounds in waking corms than the dormant stage. Furthermore, the radical scavenging activities of saffron corms were studied by 1,1-diphenyl-2-pycrylhydrazyl (DPPH) test and EC 50 values were determined about 2055 ppm and 8274 ppm for waking and dormant corms, respectively.